The third in my series of mystery novels hit the scene in January, 2017. I know I’m slow about the announcement, but you need to slog a mile in my shoes. The title is “Five, Six – Deadly Mix,” and the cover art can be seen on the right along with the other two covers. In this book, my thirty-something lady, Casey Fremont, is again forced into the role as an amateur sleuth. She is recruited by the local police & FBI to uncover the fraud and theft culprits at a local hospital. With her helpful roommates, she dodges death once more. Love life is a mess — as usual. A new character pops up to lend a hand catching the bad guys, and provides a segue twist for my next novel – a thriller. A young lady, Julie Bulissa Kohl, is writing an article on Arkansas authors and contacted me. She sent a dozen or so interview questions to which I responded. Julie said the article should appear around the end of July and she will send me a link. I’ll pass the link on to you so you can see her column with a bit about me. For those who did not enter, you missed a chance for FREE money. Tsk, tsk. I will announce/contact the winners by the end of June, 2015. The wisdom of Will Rogers: Good judgment comes from experience, and a lot of that comes from bad judgment. I didn’t think selecting actors to fill the roles in a book being made into a movie would be such a daunting exercise. I was wrong … so I’ve made a couple of modifications to the rules (which are located in the previous post here on my blog site). I included brief descriptions of the six characters and have extended the deadline. Contest closes on May 31, 2015 with winners announced by June 30th. These descriptions may help you pick actors. Acacia (Casey) Fremont is a thirty-something lady desperately working to regain her self-esteem after a disastrous eight-year marriage. Her husband left her for a teeny-bopper named Bambi. At 5′ 8″ she is an imposing figure and runs to stay fit. Effie Tremayne is in her 20s and is from a small town in Arkansas. While she is intelligent, she is naive and not wise in the ways of the world. Aaron Kincaid is a flight attendant; he is also black and gay. He is confident and secure in his own skin. Falcon is dark and brooding and is appealing enough for Casey to ask him out to dinner. He carries a Sig Sauer and can handle physical attacks. Rebecca (Becca) Rider is the receptionist at the temp agency Casey uses. Becca is a bit overweight and black. She helps Casey in solving the mysteries. Dennis Epstein, a Detective Sergeant with the Little Rock police department. He is tall, dark and handsome and is Casey’s primary love interest. 1) No entry fee; cash awards. No purchase necessary. 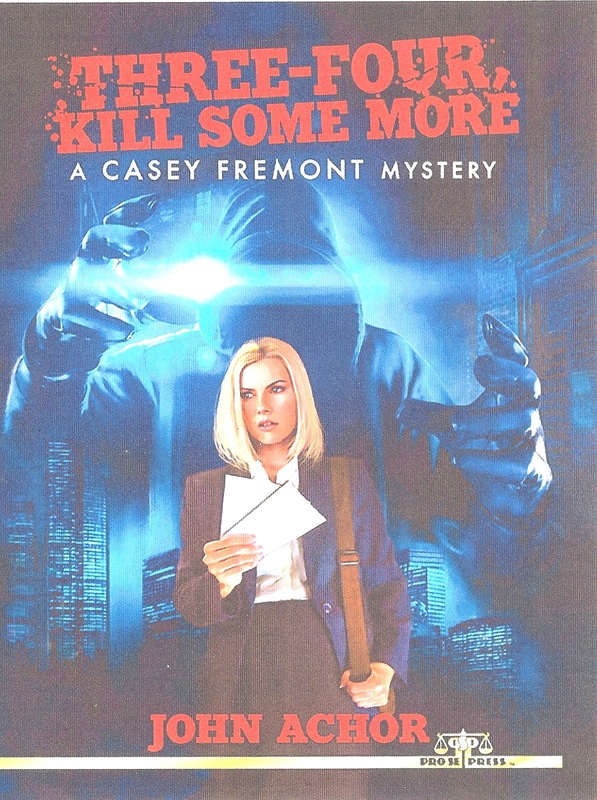 This contest is to celebrate the anticipated release of the second book in the Casey Fremont mystery series, “Three, Four – Kill Some More.” I’m rooting for May Day. 2) I do NOT have a movie option on my mystery novel, but we can certainly play “Let’s Pretend.” In this contest, you will be a Hollywood Casting Director. Based on my first book, “One, Two – Kill a Few,” you will be in charge of casting real-life actors/actresses for various roles in the movie. 3) You are eligible as long as you are not the author (well Duh), publisher or an employee/associate of the publisher. The contest will be judged by an anonymous group of book readers and movie buffs. That group will be blind judging the entries. I will assign a number to each entry and forward it to the judges. They will select three entries for the awards: First place – $100; Second place – $50 and Third place – $25. Cash prizes will be in the form of a pre-paid credit card. Ties will be broken by a random drawing. 6) Entries: By email ONLY, addressed to: john@johnachor.com with “Casey Contest” in the Subject line. The contest will open today, April 2, 2015 and continue through the close of business on May 31, 2015 April 30, 2015 Winners will be announced no later than June 30, 2015 May 31, 2015. 7) By submitting an entry to the contest, the entrant gives the author the right to use winner’s name, city, state for publicity purposes. 8) Winners will be notified online (blog site) and by email. Pre-paid credit cards for the first three places will be sent by USPS. I will order the eBooks via Amazon as gifts.